I was recently made aware of a very interesting art/advertising collaboration called The Ritual Project. 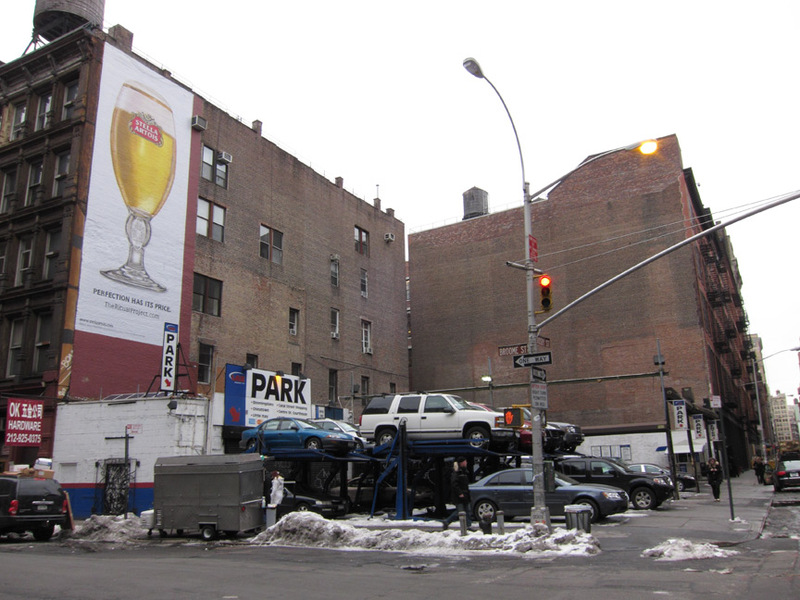 In it, Stella Artois contracted Sky High Media, or Colossal Media, to paint each frame of a billboard sized time lapse, depicting "the perfect pour". Colossal media is co-founded by Adrian Moeller, who also co-founded Mass Appeal magazine in 1996, and is also the company responsible for the Banksy murals in Soho that appeared late in 2008. The project is as much about the team of mural painters as it is the advertisement, highlighting the skill involved in this dying artform. Watching the herculean task of painting each frame of the time lapse only to see it buffed before the next frame is painted, really gives you an incredible sense of the work and dedication it takes to create such large scale works. In fact the "performance" aspect of this project was well understood by Stella Artois, as evidenced by this tag line from the website. "Whether pouring the perfect Stella Artois, or recreating it as a massive piece of art, the magic lies in watching it come to life." I couldn't agree more. If there is magic associated with this project, it surely isn't in the final product. As a resident walking by this project as it took place over the many days required to complete the time lapse, I would have been excited. I would have been less interested in the image being created of a Stella Artois glass, but while the painters were racing against time, I could have enjoyed watching them play with the side of a building in such a creative way. After all, unless you knew about the project before hand, watching painters paint, then buff, then paint a nearly identical image over and over again would have been odd and amusing to say the least. In this way the project would have kept my attention and provided me with an interesting interaction in public space, something we continue to think has a positive affect on our public environment. 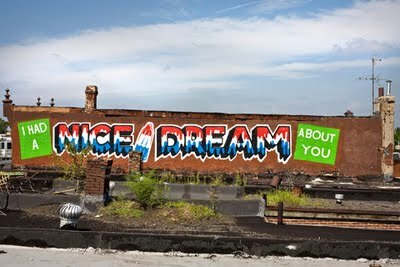 Another recent project you might know about is Steve Powers' A Love Letter For You in Philadelphia. 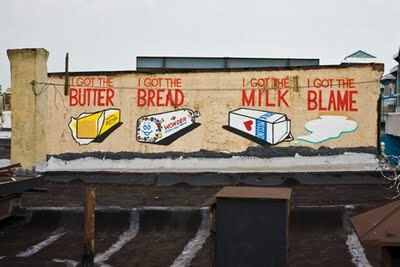 This immense mural undertaking, created over 30 murals along the Market-Frankford elevated line in Philly. The project depicts a series of "love letters" or pronouncements of love with heartfelt sentiments like, "If you were here, I'd be home" and "Your everafter is all I'm after." Although I was not in Philadelphia for the production of these murals, I can imagine the performance aspect of the project was in some way similar to The Ritual Project. As a resident one would watch these murals going up one after the other, unaware of the intention behind them as they seem almost out of place in their sincerity and eloquence. As with the Ritual Project, one could enjoy the mystery of it all while watching the streets you live on change before your eyes. Both projects to me provide a wonderful moment for public curiosity that enlivens public space creating a sense of interest in the public environment where there might not have been any before. What is interesting to me, and illuminates some of the differences between using the public space for advertising VS artistic production, is what is left behind. In the case of The Ritual Project, we are left with an advertisement, an expected call for our attentions, and an expected outcome in an environment often used as a venue to sell goods and services, and a disposable image. In the Love Letter project we are left with something much less fleeting. The murals are unexpected moments of kindness and their permanence allows us to enjoy this feeling on a daily basis as they become landmarks which define the neighborhoods in which they exist. And this might be on of the most important differences between advertising billboards and artistic mural productions, despite them both being painted by highly skilled artists. Endurance, permanence, and investment are all qualities of the Love Letter Project that the Ritual Project lacks. Both projects may have been interesting to watch but what Mr. Powers has created will last and continue to give to the city long after the actual production is over. Not only do these murals become ways in which the public can identify areas of the city, but they begin to define the city more broadly. 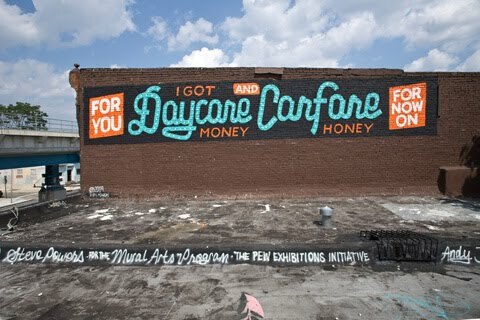 No one would say, "Take a right at the Stella Artois advertisement", but they might say "Take a right at the, 'For you I got daycare money and carfare honey for now on.'" mural. This is in part because advertisement is fleeting and makes no real investment in the space it occupies, but also because the artwork does just that and therefore becomes a part of the space in which it exists and the lives of those who live there. The difference between these two projects I feel exemplifies why advertisement, no matter how interesting, beautiful, or artistic, falls short of using our public space in a meaningful way which ultimately adds to the city fabric. Public space can be used or spent in the typical sense, or it can be altered in ways which increase its value for everyone that interacts with it.